"Help Modernize Missouri's Energy Infrastructure!" 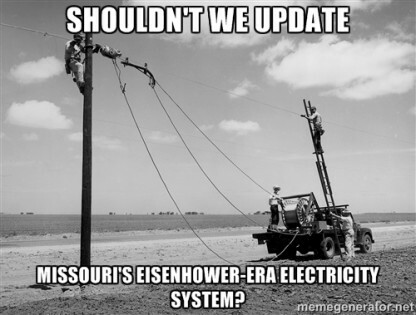 Missouri’s utility framework has not been updated for more than a century and much of its existing grid infrastructure has been in place since the Eisenhower Administration. In the meantime, residential consumer electricity bills have increased nearly 60 percent since 2007. But new legislation will modernize our electricity regulations, improve cybersecurity, set electricity prices caps for consumers, and help ensure greater rate stability and transparency at the Public Service Commission. In fact, estimates show that the average Missouri household would have saved nearly $200 this year if this proposal’s rate structure had been in place.